Retail is a tough business these days. Mega stores are shutting down mom & pop operations all over the world. Saturday afternoon I visited a clothing store downtown Vienna that has been in business under the same family ownership for the past 108 years. That's staying power. It has endured two world wars, bombings, fires, the great depression and numerous other challenges that I can't even begin to imagine. 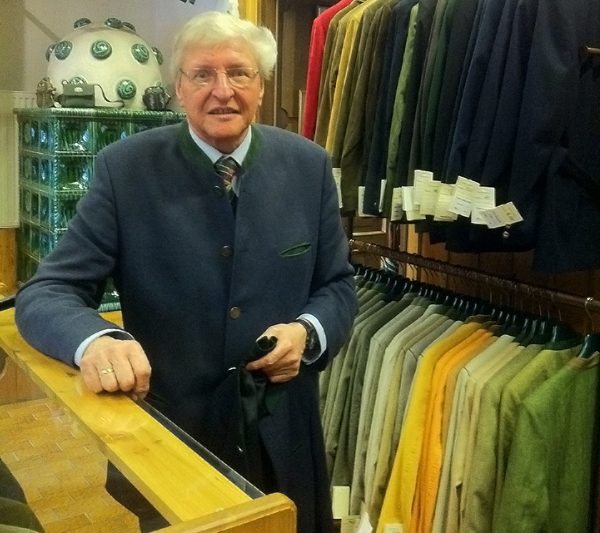 As I compare my experience of buying a traditional Austrian coat at Loden-Plankl with my previous week's shopping attempt in Vienna in which I blogged about here, there are obvious differences that I am certain have contributed to their century-long staying power. Unique Merchandise. Loden-Plankl sells primarily traditional Austrian clothing. While it might not be the "it" thing to wear, their apparel is never out of style ( I thought the multi-button collarless sports coat was a very stylish, thus my interest). In a sea of stores selling the same stuff, Loden-Plankl was the top-of-the mind suggestion from my friend Barbara Shantz. Location. You don't stay around for a century at a bad location. The store was at the heart of tourist and local traffic near famous landmarks. Even without a map I was able to find the store on my own. Service. I had strong complaints about the lack of help and friendliness of Viennese retailers. Not true here. I was helped right away by a knowledgeable and helpful older gentleman who knew exact what size of coat to show me.Â Even though he first told me he didn't speak much English, he made it work. Quality. I bought a cashmere wool coat that fit like it was tailored just for me. The craftsmanship is obvious by the hand stitching and the subtle piping along the lapel, pockets and back of the coat. Fair prices. Ok the coat was not what one would consider a bargain, but it was not grossly overpriced as were most the other designer apparel nearby. My friend Steve who was with me at the time even commented: "I expected it to cost much more than that." Most small shops are disappearing from the market because they cannot compete with large retailers playing the margins' game with merchandise that's found the world over. if I were in the retail business I would take a serious look at successful enterprises likeÂ Loden-Plankl and take a clue from their playbook. After all, they have stared retail giants down and keep carving their own niche. What's your best shopping experience lately?